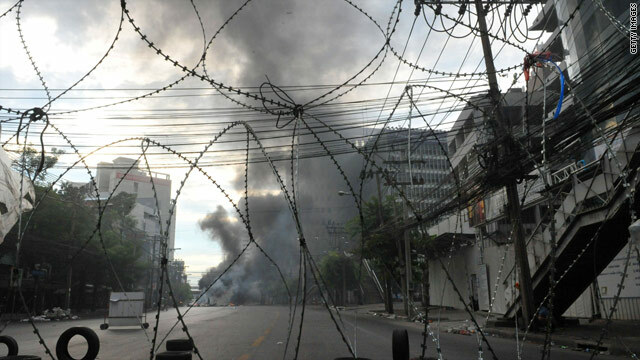 Fires burn on a boulevard near the Pratunam intersection in downtown Bangkok. 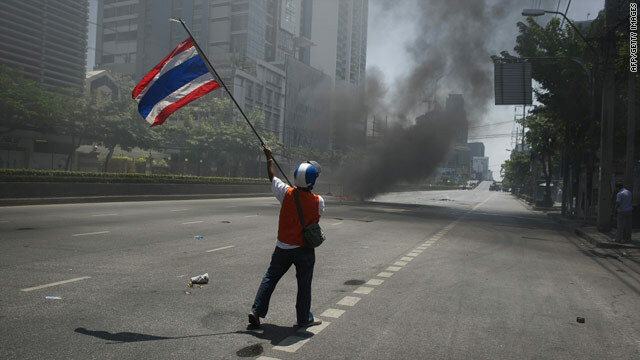 Bangkok, Thailand (CNN) -- Arwut Siripanich's wife and daughter begged him to leave their home in the Bangkok neighborhood close to the site where anti-government protesters have camped out for days. Instead, he placed steel barricades and potted plants out on their street to keep anti-government protesters out and settled in for the long haul. Siripanich, a 64-year-old landlord, is hunkering down with nine other people -- five men who work for him, their partners and children. The men rotate on guard duty throughout the night. Siripanich said he trained the women how to fight back if any of the demonstrators, known as "Red Shirts," try to break in. They have been holed up for a full week now. "It's natural to be afraid," Siripanich said, but he is most concerned about providing for his family and his property -- he owns the five-story building. "I want the soldiers to clear everything up," he said, irritated at just what is happening outside but also at the political unrest nationally. "I just want to have a normal life again." Siripanich's crew buys food daily at a market downstairs, but they must show their identification documents to soldiers to get in and out of the building. Protesters have piled up a large number of tires on his street. When Siripanich peeked out a few days ago, he saw two big boxes. Worried they could be bombs, he warned everyone to stay away. They could hear gunfire "all day, all night," he said. Somsong Chareonsuk, 46, and a friend have holed up in a home where Chareonsuk works as a housekeeper near the violence. She was told by her employer to stay and look after the house and their dogs. The pair bought food and water in advance. They watch television to pass the time. They hear gunfire crackling every night and big blasts. "I don't know when the bombs are going to explode -- I'm most scared about not knowing," she said. "I'm also scared the buildings around our house might catch fire. Tires are being burnt nearby." At the end of each day, the Red Shirts have a meeting outside the house, but Chareonsuk doesn't want to interact with them. "We don't sleep at night. We stay up guarding the house until 4 a.m. every day. At night, it's so quiet that even small sounds from outside make us jump," she said. Chareonsuk is glad that soldiers pushed the Red Shirts farther up the street Wednesday. "Even though things are calmer outside, I still can't leave -- the road is still blocked," she said. Back at Siripanich's building, they hear the fighting may end soon -- hopeful news for a group who wants their lives to get back to normal. "I don't feel safe and it's affected my life -- I feel depressed," said Rachaet Sanging, 36, who works for Siripanich.